11,000: Number of ‘ashbit’ particles Delsin shatters into during a single smoke dash through the air. Each particle is individually textured (including the custom jacket! ), before reforming! 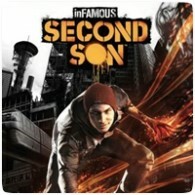 75: Number of high-resolution scanned poses of Troy Baker’s face that were needed to train our performance capture system to produce Delsin’s facial animations. Troy had 168 tracked markers placed on his face and his head mesh resulted in 22,321 separate vertices (not counting his eyes, lashes, or beanie) that were used for various in-game animations. 32 machines are used in the render farm that computed all the reflected/ambient lighting in the game. Each rain drop is considered a particle and there are over 30,000 of them. There are 1,024 sound variations of the smoke bolt. It will rarely sound the same twice. Adaptive Ambient System enables each district to have its own atmosphere that conforms to the time of day, type of weather, and if the DUP controls it or if Delsin has freed it. Over 50 individual sounds are used in a smoke orbital. Delsin’s head is built out of 60,000 triangles, plus 7,500 triangles for his beanie. We have 168 skeleton joints just for Delsin’s face. The blocks in our version of Seattle are 100 meters square. That’s exactly the same size as an actual Seattle block. During our cut scenes, each of the 20,000 vertexes on Delsin’s face is animated independently, thirty times a second.